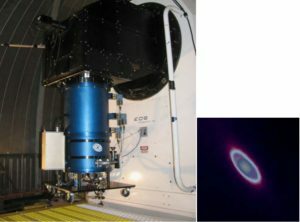 (Left) NESSI on the MRO 2.4m scope during commissioning. (Right) False-color subtracted (K-H band) image of Saturn using NESSI in imaging mode. Application of SHM to Reusable Launch Vehicle (RLV). SHM modalities at each stage of spaceflight. A significant step in addressing the safety of space vehicles is development and testing of the flight information recorder, or “black box”. 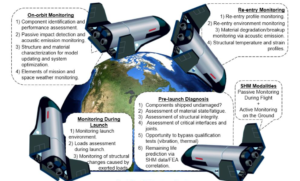 It is envisioned, that a structural health monitoring system (SHM) would be an integral part of the “black box” and would record information on structural integrity during all stages of spaceflight. In this project, the team proposes to investigate the effects of the space environment on piezoelectric sensors – active elements of SHM, to explore structural vibrations in microgravity and to demonstrate the feasibility of SHM during long term space missions. To achieve this goal, 1U and 3U payloads (depending on space available) are proposed that will fit into a Nanoracks system outside of the ISS. Mission duration is expected to be less than 1 year (1 year maximum) with minimum of crew time. The power requirement is estimated to approach a few watts. The data collected in the proposed experiment would also benefit the FAA Center for Commercial Space Transportation. The principal investigator is a mechanical engineering professor that has previously participated in a NASA EPSCoR project and launched several suborbital payloads through the NASA Flight Opportunity Program.